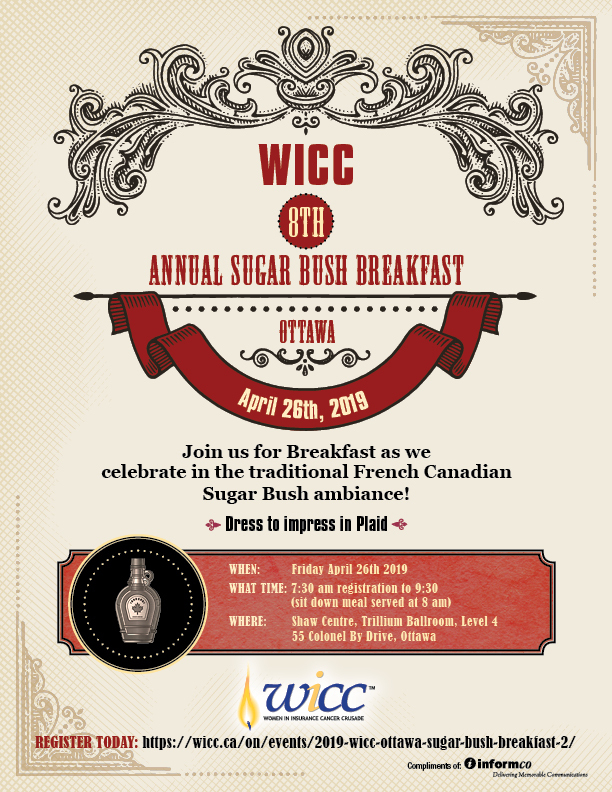 OTTAWA, ON, April 4, 2019 /insPRESS/ – WICC Ontario invites the National Capital Region’s insurance community to secure their tickets now for the 2019 Sugar Bush Breakfast, to be held April 26 from 7:30 am to 9:30 am at the Shaw Centre in downtown Ottawa. Don’t forget to wear your plaid shirt! Tickets are just $50 per person or $500 for a table of 10, plus HST. Purchase yours here. Now in its 8th year, the annual Sugar Bush Breakfast gives busy insurance professionals an easy way to support the fight against cancer, learn more about WICC’s mission and current initiatives, reconnect with colleagues and be entertained – all over a delicious meal before the business day begins! This year’s Sugar Bush entertainment lineup includes highland dancing, singing and fiddling. Plus, attendees can experience the INcarcinoma art exhibit, which merges photography and poetry to document a young woman’s journey through breast cancer. Sponsorship opportunities are also available. For as little as $500, interested organizations can reach a substantial audience of insurance decision-makers and align their brands with WICC, one of the most respected and prominent organizations in Canada’s P&C sector. Click here to obtain tickets, venue information and full sponsorship details. Founded in 1996, WICC is a volunteer-run organization whose mission is to mobilize Canada’s insurance industry in the fight against cancer. Since its inception, WICC has raised more than $14 million for cancer research, patient support and public education. WICC Ontario is the largest of four provincial chapters, which include Alberta, B.C. and Quebec. Learn more about WICC and upcoming initiatives in which you or your organization can participate at WICC.ca.